The trend for a fuller, thicker pout may be called the ‘Kylie Jenner’ effect, but the fact is that throughout the ages women have been using a variety of methods to hydrate and increase lip volume. Now, more than ever, probably due to selfie-culture, pout prominence has gained appeal and as a result, cosmetic houses everywhere have come up with formulae to help you achieve a fuller pout and hydrated smile. One such product is Instant Lip Plumper by Instant Effects. We begin our review of this item with an exciting assertion from the manufacturer, namely that you will have a fuller out in two minutes. The company says you should expect a product that This no-sting gloss glides on to leave your lips soft, hydrated and with more volume. The effect of these ingredients is that patented technology along with Hyaluronic Spheres increases your lip plumpness, giving it more volume. Your lips are also more moisturized so dry areas and cracks are smoothed over and your lips look more nourished. Hyaluronic acid retains moisture in a superior way, and silica seal it in. However, other clinically proven ingredients need to be present to truly give you long-lasting, more visible effects. These include vitamins C and E, which are not separately included, although some of the benefits are present via the other ingredients. These vitamins prevent a dried out, sagging look and work hard to make sure that cells continually renew themselves. Wheat extract, WIllow herb Flower, Peppermint oil, Pink Purslane are but a handful of other superior proven ingredients not included. They are all shown to boost elastin and collagen while nourishing the lip area, including fine lines around it. Click the button a few times to release the liquid from the wand. Then smooth the liquid on via the brush. You should see a difference in two minutes. If you want to apply lipstick, wait five minutes, remove any excess then put on lipstick as normal. You’ll pay $35.00 for the lump plumper from the product website. There are no discounts but there are some bundles involving other Instant Effects products that you can purchase at a discounted price. There are no refunds, replacements or exchanges on any opened or used items. This means you can try the product and return it if you are not satisfied. Unopened goods qualify for a money-back refund or exchange in 14 days. 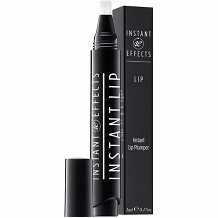 Instant Effects does not test their lip plumper on animals and product vegan-friendly items. The formula also does not rely on a sting-and-aggravate method of plump your lips. Relying on the working of Hyaluronic acid is fundamental as the compounds contain therein offer superior moisture and hydration. However, ingredients which could boost collagen product and elasticity in the long term are missing, as are formula components that have been clinically proven to keep your mouth and lips looking young and firm. Although patented technology is incorporated, a lip plumper needs five patented ingredients and a minimum of 10% active ingredients. When measured against these standards, the product also falls short. While it is admirable that the company outlines the various kinds of lip structure and what you can expect in each case, it offers no third-party testing to verify these measurables. Given this, the lack of key clinically proven ingredients, and a no-return policy for opened goods, your risk when purchasing this cosmetic item is rather high.